At Miari Stables Sport Horse Breeding, we bring several decades of breeding, riding, and training experience to our sport horse breeding program. It is our desire to produce foals who have both the temperament and the movement to succeed in dressage, (and maybe some jumping, too!). 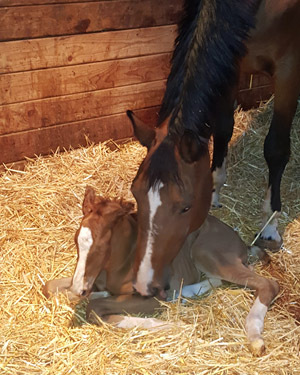 We breed primarily warmbloods, but also a couple of German Riding Pony/warmblood crosses for the smaller horse market, and a couple Half-Arabian/Warmblood foals for the Half Arabian Sport Horse market each year. We spend many hours researching bloodlines, movement, conformation, temperament, soundness, heritability outcomes, progeny success, and sport results of the world’s top stallions to make the best match with our carefully selected group of broodmares. All of our mares have been accepted into the Oldenburg Main Mare Book, and must demonstrate excellent movement, temperament and conformation. We present all foals to the European warmblood juries, and we show our young horses in Sport Horse in Hand and Materiale classes to receive feedback from judges trained in evaluating a young horse’s talent for dressage as well as our breeding program. We are thrilled with our results! 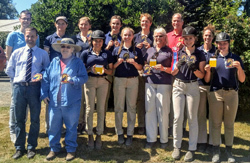 Having produced over 100 foals since our first in 1990, many of them have gone on to top honors regionally and nationally in hand and under saddle through all the levels to Grand Prix in dressage, including some with CDI placings. Additionally, a few have found success winning over fences in the hunter/jumper rings, and on the eventing circuit. We have produced an exceptional number who have been awarded premium designation both as foals, and as breeding stock with their respective organizations. 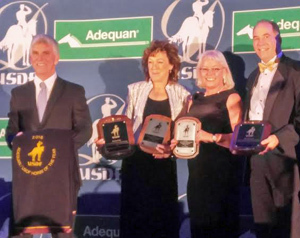 We have also been honored to produce a number of foals being awarded the coveted Foal of Distinction award as well as several who have been designated stallion prospects. (Fun fact: 36 premium foals of the last 46 presented have been awarded Premium or Elite foal designation!) 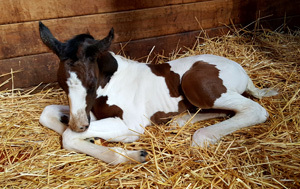 While we currently work most closely with the Oldenburg GOV, we have mares and foals registered and inspected by the Dutch, Hanoverian, Swedish, Westphalian, Weser Ems, and Half-Arabian registries. 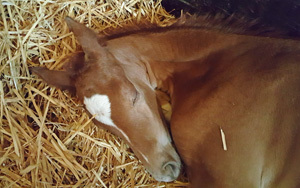 We oversee the complete life of our foals, from conception through to the time they find a new home. 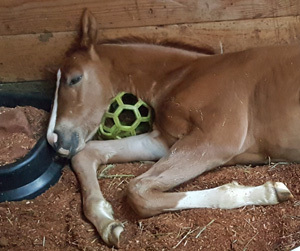 While at Miari, the foals receive regular handling, vet work, careful feeding, socialization with humans and horses, exercise, and age appropriate training from birth until sale to provide them with the best foundation to be successful sport horses and well-adjusted and fun partners for their future owners. We hope you will take a look at what we have to offer if you are shopping for a sport horse partner! 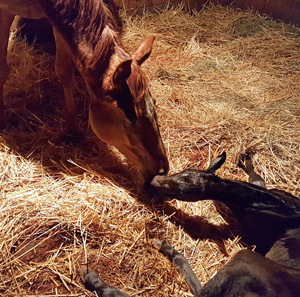 At Miari Stables, Kari McClain has developed an integrated holistic approach to building a breeding program. The Miari Program provides guidance proven prenatal care, foaling and training from day one until they depart for their new home. Each foal is cared for by our well trained and observant staff. Foals, weanlings, yearlings and youngsters alike are looked after and administered to as is appropriate for their age. All are monitored for health and soundness regularly. It starts with a pedigree, doesn’t it? Like developing a fine wine, Kari matches her intimate knowledge of her mares’ bloodlines, conformation, temperament, and movement to the stallions she feels will best complement them to produce an exceptional youngster. 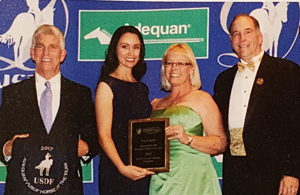 Miari horses have garnered awards and accolades from breed shows and registry inspections for being some of the best young sport horses in the country. She feels great accomplishment seeing many of them progress through the levels in their chosen sport.